The American people have spoken, and have spoken clearly indeed. Barack Obama is the President-elect. The other day, I witnessed as history unfolded before my very eyes. For the very first time in this country, an African-American had been elected as President. A hundred years ago, who would have thought that this would be possible? 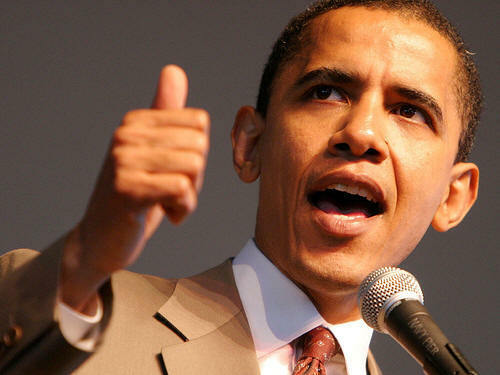 But Barack Obama proved that indeed, with hard work and determination, everything can be made possible. Obama has successfully carved a name for himself in this nation’s history. And I applaud him for it. But I have to admit, I was in tears as I listened to McCain’s concession speech. I wished things went differently for this man who endured so much to serve this country. But now that everything has been said and done, it’s time to move on. McCain is right. In his speech he urged his fellow Americans “to offer our goodwill and our earnest efforts, to find ways to come together….to bridge our differences to help restore our prosperity, defend our security in a dangerous world and leave our children and grandchildren a stronger and better country than we inherited”. As the President-elect, I will give Obama the respect that he deserves. I have no doubt that I will not agree with him a hundred percent, but I wholeheartedly wish him well. But while this is so, it doesn’t mean that I will allow my godly ideals to be compromised. I will continue to fight for the unborn and for the institution of marriage to remain as God has designed it to be : between a man and a woman. Above all, I will intercede for our new President and pray that may God give him wisdom as he takes over the most important job in the whole world – as President of the United States of America. He alone is in control! God bless you, President-elect Obama. And God bless America! Anyhow, it felt good to exercise my right as a citizen. I took a stand and let my voice be heard… all without even uttering a word! This was my very first time to vote in the U.S., and may I say, for not just any other elections. By the voter turn-out, it’s obvious that this is a very important election for Americans, the results of which will be a turning point in the history of this nation. Now you might ask, who did I vote for? Well, let me tell you – I voted for NEITHER of the candidates. What??? By this I mean that I voted not for any personality, not for any party nor for any platform. As a child of God, my real party affiliation is with Jesus and His Word, the Bible. Thus, I would vote for any one whose principles line up according to the word of God. For what use will it be if we GAIN THE WHOLE WORLD BUT SUFFER THE LOSS OF OUR OWN SOULS???? This sure simplifies things, huh? In the above passage, Joshua asked the question, “Are you friend or foe?” And the answer was given, “I’m neither one, I am commander of the LORD’s army.” How interesting that this mighty angel of God did not even consider the question of whether Joshua was friend or foe, for the angel saw his role as servant to God as first and foremost. His like or dislike for Joshua had nothing to do with his position of serving God. It must be the same for us. I always wonder why people would want to live in a Kingdom called Heaven in the next life to come, if they don’t value the Kingdom of Heaven and its values here on earth. So out of reverence for the King, His Kingdom, and His values, it’s a no-brainer. I chose McCain simply because McCain is in line with God’s heart and Law. Jesus once taught us to pray “let Your will be done here on earth as it is in Heaven”. It is time we do this. Let your declarations be demonstrated through your actions. Vote for the glory of GOD! Today marks the beginning of the early voting for the US Presidential elections here in Florida. I don’t want to go delve into a discussion of who you should elect, but I just want to encourage you to vote. Exercise your right as a citizen of this country. Participate because you care. And as a Christian, please choose the candidate whose principles are in line with the word of God. Choose the one who fears (reverends) Jesus Christ, Our Lord. Ask the Holy Spirit to give you wisdom and guide you in this very important choice. And most of all pray. Pray for this nation. Pray that the RIGHTEOUS one will prevail; that the one who wins is truly the one whom the Lord has appointed to govern this nation during this very crucial time in history.